He tells me he has never done that before. CFRA Ottawa. This is an open letter to all of you. I want to start it by telling you why I became a lawyer. It was a movie, called The Oxbow Incident. It was a Western, released some 75 years ago, and it starred Henry Fonda. It was about how a mob hanged a man. The wrong man. That speech is why I became a lawyer. What Fonda said, in a long-ago Western. What he said about justice, and how it is the thing that makes us human. Jody Wilson-Raybould, who I have never met, and Jane Philpott, who I have, remind me a little bit of Fonda, reading that dead man’s letter. They seem to believe, as I do, that if we do not have justice, we have not much left. They proudly gave up everything for it, after all. After what you Liberals did, I suppose you are expecting me to liken you to a lynch mob. And, it is true: You were a bit like that. Hell, you expelled Wilson-Raybould on the pretext of her making a tape on which a powerful man threatens her. When, a few days later, the prime minister of Canada spoke to Wilson-Raybould about why she’d been demoted — and he didn’t bother to tell her his principal secretary was secretly listening in. Keeping a record of what was said. But, still, I will not call you a lynch mob. What you are, more accurately, is a group of people who belong to a cult. It is not a political party anymore. It is a cult. It’s kind of understandable, although not ever forgivable. Justin Trudeau, to most of you, is the Liberal Party. He lifted the party from third place to first, and he propelled most of you into power. He made three big promises. He said he’d be a feminist. He said he’d reconcile with indigenous people. And he said he’d bring back ethical government. Well, he lied. His willingness to brutalize Wilson-Raybould, Philpott and Liberal MP Celina Caesar-Chavannes — and to cut a sweetheart deal for a sleazy donor — showed him to be none of those things. It showed him to be what this newspaper memorably called him this week: The fake feminist. But still you follow him. Still you belong to his cult. Even when you know he has done wrong. And so, you will end like all cults do: You will go down with your leader. You will perish with him, and you all richly deserve it. Because voters understand — as they did at the end of The Oxbow Incident — that justice is all that keeps us from devolving into a lynch mob. Which, as I say, you all resemble quite a bit. And for which you will all pay. So very well said Warren. A very sad time for our country on the world stage. This “cult” does not represent the people, we are ashamed and we are angry! If Justin Trudeau had a coinscience he would step down and apologize for his wrongdoing and unethical behaviour …. but he will not, a narcissist is never wrong! Wow-I have the utmost respect for you. And, not only that, you are 100% correct. Thank you for writing this letter. I must tell you that I live in Quebec since 4/2017 having moved from Ontario. The Federal Member of Parliament(in our area) is a Liberal, William Amos, also a lawyer like you. No, we did not vote Liberal. Having said that, I have always tried to be informed especially on political matters and vote according to my conscience. I will be sending an e-mail to Mr Amos and suggesting that he read this. Keep on writing your thoughts, they are respected. I used to think that what you were you doing was burning a bridge, but I can see now that what you’re doing is chasing away a proverbial arsonist and saving your political home. It takes a ton of guts to do what you’re doing, and wven your political adversaries can see it. We’ve lost a huge battle. We won’t lose the party long-game, post election defeat. I was referring to it’s inspid leader. Many thanks mr. Kinsella. Your letter is the best way to describe what these Liberals under the Leader Justin Trudeau have become. Too much power will loose it,s master. I only wish that never again we have a majority in Government. As we live in corrupt times, and the Electra are totally out of touch. My husband and I will raise our glasses to you to-night as well as these courageous women, who fought the Liberal cult and were unjustly punished. Reading this and reflecting upon what has transpired gives me chills. I am appalled that my MP, Andrew Leslie, formerly the commander of Canada’s Army, is willing to go along with the travesty unfolding before him. In an email to me, he claims to have been a friend of each of them but then spews the tired rhetoric of broken trust, etc. Thank you for writing this letter and addressing the hypocrisy of Trudeau having another party listening in taking notes with JWR’s knowledge. I am not sure I see how what he did was any different – other than it allowed room for errors in note-taking. At least her record was accurate. Sadly, I believe your letter’s message will fall on deaf ears. Very disappointing situation overall. Thank you for writing this letter to the liberal party and addressing Mr. Trudeau’s action of having another party listen in to take notes. I fail to understand how he cannot see the hypocrisy of that…at least JWR’s information would be an accurate reflection of what was said as opposed to potential errors in notes being taken. Sadly, I fear your letter will fall on deaf ears with the intended recipients. Let’s hope that will not be the case for the voters. So very true every word, it is quite rich that a PM which spews his views on ethics is the only person in his position in Canadian history to be charged with 4 ethics codes violations. 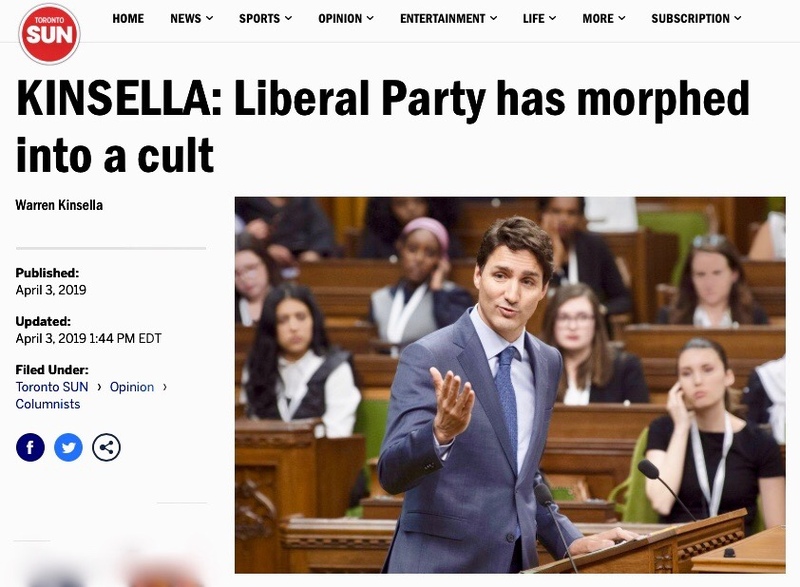 A cult is exactly what these people are, let us all hope that their are enough intelligent voters in this country who can see through this total deception on the part of Mr Sunny Ways. Not so Sunny now are you that you have been exposed for who you truly are. As a lifelong Conservative activist, I appreciate your candor. The ‘cult’ designation is not confined to the Liberal Party. It is true that power corrupts and no one is immune. In my opinion, political parties have undermined our confidence and trust in our governance institutions. Their focus on acquiring and holding power has left the corpse of representative government rotting in a ditch. This and other commentary you have made is well worth pondering. Thank you for your contributions to reason and sanity. Any politically sentient person recalls the command and control cult personality of a Harper PMO. That was a place of obedient devotion and well understood fear. Thank you for having the insight and conviction to write this eloquent letter. I have always respected your opinion and you have really blown us away with such a powerful letter! Words of wisdom. “Power Corrupts, Absolute Power Corrupts Absolutely” When will voters ever learn? Diapers and politicians have to be changed regularly and for the same reason.